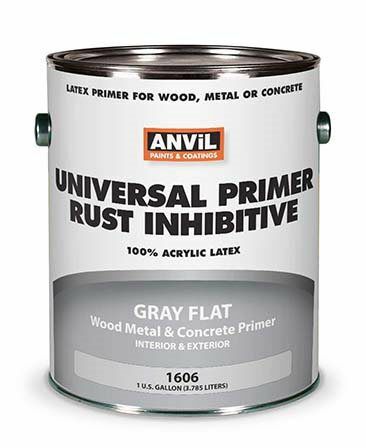 Apply Anvil 1606 Rust Inhibitive Universal Primer on steel, slate, aluminum, wood, galvanized and other non-porous surfaces. Use as a rust inhibitive primer. Use over spalled reinforced concrete where re-bar is showing. Prevents sap staining of unprimed wood, and water stains in ceiling panels. Markedly reduces corrosion of ferrous metal and enhances adhesion of topcoats over chalky surfaces. New regional Volatile Organic Content (VOC) regulations (SCAQMD) differ from the U.S. Environmental Protection Agency (USEPA AIM) national standards, this product can not be sold or shipped to the following area: the greater Los Angels basin. Colors shown here may vary from actual product due to variations in computer monitor settings. Dry samples are available upon request. 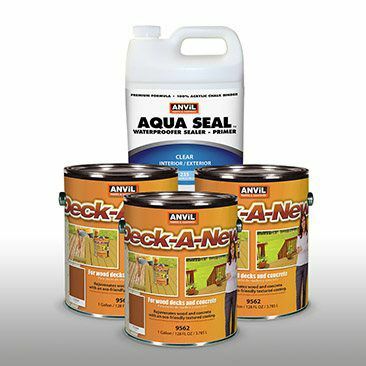 Anvil Deck-A-New Wood & Concrete Textured Resurfacer is a rejuvenator coating for weathered or damaged wood and concrete surfaces. Deck-A-New's beautiful textured solid color finish repairs, structurally sound, wooden and composite decks, concrete patios, walkways steps and porches while offering maximum protections to preserve the surface for years. The coating encapsulates splinters and fills cracks delivering a beautiful slip resistant finish that is scuff, peel and chip resistant. Protect both interior/exterior vertical/horizontal wood and concrete surfaces with lasting durability. Wooden Surfaces: replace rotting or unstable decking boards and remove all loose splinters. Clean the surface to remove mildew, dirt, and oil prior to application. Level all nail or screw heads. Concrete Surfaces: remove all dirt, efflorescence, grease, oil, waxes, silicone products, and other foreign material that would interfere with the adhesion of Deck-A-New. Un-coated smooth steel-toweled concrete floors (floors with no porosity) must be totally cured, and cleaned with Anvil Clean & Etch #1450. For best results, must apply two coats by brush, roller or texture sprayer. For normal aged wood, composit or concrete decks use a synthetic roller with a 3/8 inch nap. For extremely weathered, cracked and damaged wood decks, apply with a nylon-loop textured roller. Apply product at a rate of 120 to 160 sq. ft. per gallon, depending on porosity (60-80 sq.ft. in two coats). Anvil 235 AquaSeal Waterproofing Sealer is a fast drying, water clean up, environmentally friendly, multipurpose penetrating sealer/primer for vertical surfaces. It may be applied as a stand alone, clear sealer or top coated with elastomeric, latex or oil based coatings. The dried film is resistant to mildew for it contains agents which inhibit the growth of mildew on the surface of the sealer film and is also resistant to acids, and salts. AquaSeal provides a tough and flexible film with excellent scrub resistance and weatherabiliy. May be tinted with latex paint or stain. Mix with equal parts of latex paint for use as a primer. Mix with exterior latex paint to increase its weatherability. May also be used as a binder sealer by adding one gallon of AquaSeal to five gallons of block filler. AquaSeal protects and seals vertical surfaces of Brick, Stucco, Concrete, Grout, Stone, Plaster, Drywall, Adobe, Simulated Brick, Metal, Chalky Surfaces, Terra Cotta Roof Tiles, Asphalt Shingles, Aluminum & Vinyl Siding, Pottery and many other nonporous surfaces. AquaSeal is designed for above grade use only and should not be used on applications exposed to hydrostatic water pressure. Elimination of cascading or ponding water must be addressed prior to Aquaseal application. For porous concrete surfaces such as fluted block we recommend AquaSeal II High Solids #236. AquaSeal Waterproofing Sealer has surpassed requirements for water repellency set forth in Fed. Spec TT-C-555B, Section 3.3.3.